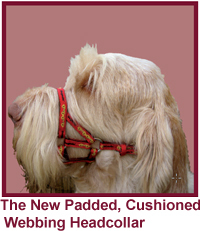 Following the Dogmatic's launch in 2001, the Dogmatic Headcollar has gone from strength to strength. It's popularity is rapidly increasing through customer satisfaction and recommendations. We have been looking to follow up the Original Leather Dogmatic Headcollar in a quality webbing/material for several years - but until now we were unable to achieve the quality and comfort we required without compromising the design or effectiveness of the Headcollar. We are confident that our new range meets our stringent requirements and will prove a winner to both Trade and Public alike. Our range of quality products are made with every attention to detail using the highest quality craftsmanship, materials and fittings. The Headcollar ranges offer control but are gentle looking with fun, friendly designs so that your dog will still look approachable and they cannot, therefore, be confused with a muzzle. We have fresh, vibrant, exciting designs and colours to match and enhance all owners' requirements. 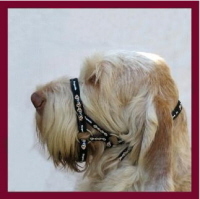 We have a superb choice of leads and collars in top quality, highly crafted matching materials and designs.